Michael Rennie was ill the day the earth stood still, but he told us where we stand. And Flash Gordon was there in silver underwear, Claude Rains was the invisible man. Then something went wrong for Fay Wray and King Kong. They got caught in a celluloid jam. 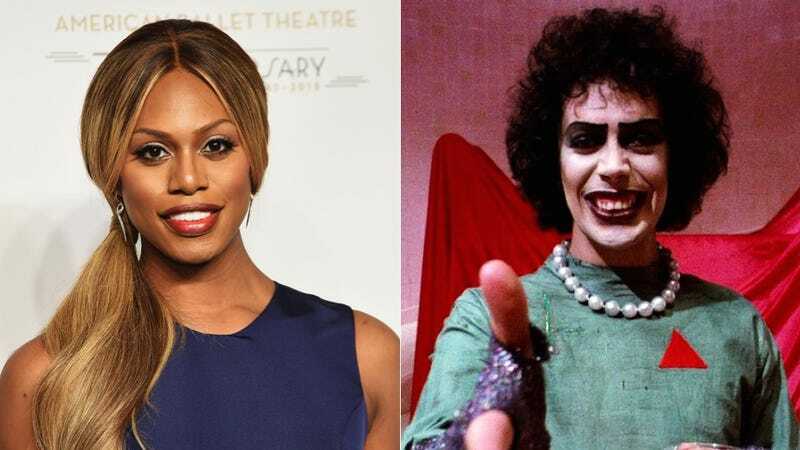 Then at a deadly pace it came from outer space and this is how the message ran: Laverne Cox will play Frank-N-Furter in the TV version of The Rocky Horror Picture Show! Fox has just announced that the Orange Is the New Black actress will fill the “sweet transvestite from Transylvania” role made famous by Tim Curry in the iconic 1975 film. (Curry also played Frank-N-Furter in the original Rocky Horror Broadway cast.) The televised remake will premiere in fall 2016. Ortega’s previous work includes choreographing 1987’s Dirty Dancing and directing films such as Hocus Pocus, Newsies, and the High School Musical franchise. The chances that Fox will be able to top the original (or that anyone could possibly top Tim Curry’s raucous portrayal of Frank-N-Furter) is unlikely, but—dammit, Janet!—I’m excited to see Cox try. Images via Getty/20th Century Fox.